Actress (inside) held off Lights of Medina to win the 2017 Black-Eyed Susan. Photo by Laurie Asseo. A total of 183 horses were nominated to six stakes, three graded, that help comprise the undercard of the $250,000 Black-Eyed Susan (G2) Day program Friday, May 18 at legendary Pimlico Race Course. 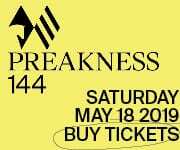 A total of seven stakes, four graded, worth $1.15 million in purses will be featured on the 14-race program, which serves as a fitting prelude to the 143rd Preakness Stakes (G1), the Middle Jewel of the Triple Crown, Saturday May 19. 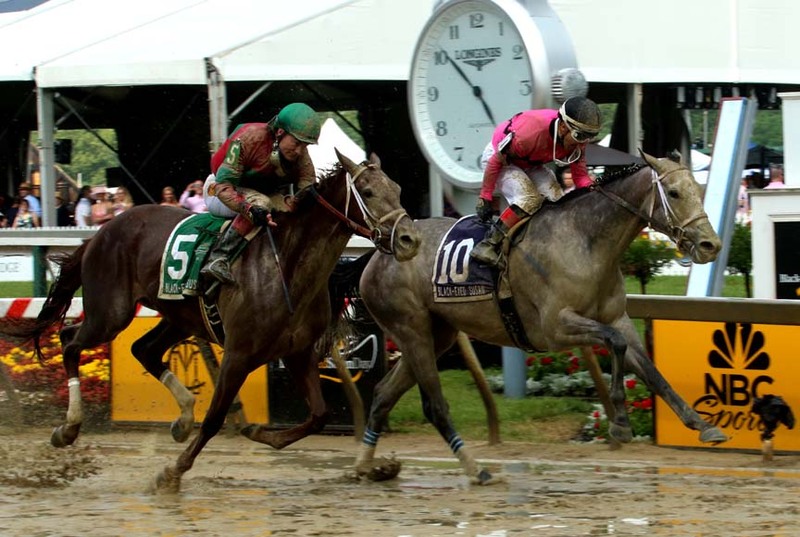 The $300,000 Pimlico Special (G3), run at the Preakness distance of 1 3/16 miles, marks the 80th anniversary of Seabiscuit’s upset of 1937 Triple Crown winner War Admiral in their famous match race. War Admiral won the inaugural running of the Pimlico Special during his championship year. This year’s Pimlico Special attracted 23 nominations led by multiple graded-stakes winners Honorable Duty, Irish War Cry, Page McKenney, Rated R Superstar and Something Awesome; Afleet Willy, whose 12 career wins include four stakes victories; and 2017 Kentucky Derby (G1) runner-up Lookin At Lee, also fourth in last year’s Preakness. Honorable Duty hasn’t raced since being pulled up in the Clark Handicap (G1) last fall but has been training regularly at Keeneland for trainer Brendan Walsh. Three of his five 2017 victories came in the Mineshaft (G3) and New Orleans (G3) handicaps and the Lukas Classic (G3). Irish War Cry won the 2016 Marylander at Laurel Park in his juvenile finale and the Holy Bull (G2) and Wood Memorial (G2) in 2017 to make him a leading contender for the Kentucky Derby, where he finished fourth. Trained by Fair Hill, Md.-based Graham Motion, he returned to run second as the favorite in the Belmont Stakes (G1) and this year was second in the Hal’s Hope (G3) at Gulfstream Park. Stronach Stables’ homebred Something Awesome is riding a three-race win streak, all in stakes, kicked off by the seven-furlong General George (G3) Feb. 17 at Laurel. He followed up with wins in the Harrison E. Johnson and $1 million Charles Town Classic (G2), both at 1 1/8 miles, the latter April 21. Pimlico-based claimer-turned-millionaire Page McKenney, trained by Mary Eppler for Adam Staple and Jalin Stable, has raced twice in 2018, winning the Old Hickory Stakes Feb. 17 and finishing fourth in the Gulfstream Park Hardacre Mile (G2) March 31. Rated R Superstar exits a come-from-behind two-length triumph in the 1 1/8-mile Ben Ali (G3) April 14 at Keeneland. The $150,000 Adena Springs Miss Preakness (G3) for 3-year-old fillies going six furlongs drew 34 nominations including Almond Roca, a multiple stakes winner this winter at Tampa Bay Downs; stakes winner Artistic Diva, Good Move and She’s Quiet, each undefeated through two starts; Limited View, a three-time stakes winner at Laurel Park; Princess Warrior, second in the 2017 Alcibiades (G1); and Laurel stakes winners Strategic Dreams and Smokinpaddylassie. Abel Tasman, the champion 3-year-old filly of 2017 who finished fourth in the La Troienne (G1) May 4 at Churchill Downs, tops 32 horses nominated to the $150,000 Allaire DuPont Distaff (G3) for fillies and mares 3 and up at 1 1/8 miles. Also prominent among nominees are Valdorna, winner of the Doubledogdare (G3) April 20; 2017 Fall City Handicap (G2) winner Blue Prize; 2017 Monmouth Oaks (G3) winner Teresa Z; Fuhriously Kissed, third in the Apple Blossom (G1) April 13; and stakes winners Analyze, Berned, Frostwise, In the Navy Now, Jenda’s Agenda, Nikki My Darling, Power of Snunner, Proper Discretion and Verve’s Tale. Most popular among horsemen with 39 nominations was the $100,000 Hilltop for 3-year-old fillies at one mile on the turf led by Thewayiam, already a three-time stakes winner this year for Motion including the Sweetest Chant (G3) and Herecomesthebride (G3) at Gulfstream Park; and 2017 Jimmy Durante (G3) winner Daddy Is a Legend. The $100,000 Skipat for fillies and mares 3 and up going six furlongs on the dirt, and the $100,000 Jim McKay Turf Sprint for 3-year-olds and up at five furlongs on the grass, kick off the renewed Mid-Atlantic Thoroughbred Championship (MATCH) Series, an assortment of 25 races at tracks in Maryland, Delaware, New Jersey and Pennsylvania which originally debuted in 1997 and ran for five years. Heading 32 nominees to the Skipat is 2018 Barbara Fritchie (G2) winner Ms Locust Point, a three-time stakes winner in Maryland, and Vertical Oak, winner of the Miss Preakness and Prioress (G2) last year, while the record-setting speedball Pay Any Price tops 27 nominees to the Jim McKay Turf Sprint, having finished second by a neck in last year’s running. PreviousPreakness: Who will tackle Justify?